They conduct power and motion between non-intersecting, parallel axis that may or may not have center groove with each group making two opposite helices. The two helix angle come together in the center of the gear face to form a 'V'. in these gears the end thrust forces cancel themselves out. Its difficult to cut this type of gear but its made easier by machining a groove in the face at the point of the apex of the 'V' creating a break in the middle of the herringbone gear teeth. They do not have any separating groove between the mirrored halves. Action is equal in force and friction on both gears and all bearings. Herringbone gear also allow for the use of larger diameter shaft for the same volumetric displacement and higher differential pressure capability. The most common application is in power transmission. They utilize curved teeth for efficient, high capacity power transmission. This offers reduced pulsation due to which they are highly used for extrusion and polymerization. 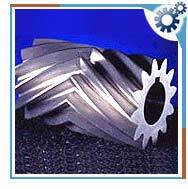 Herringbone gears are mostly used on heavy machinery.